Legal for trade PBS features stainless steel constructed base and indicator housing along with bright LED readout. 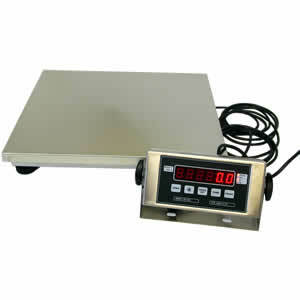 It is NTEP approved for weighing in pounds or kilograms. Large platform makes the PBS-500 suitable for weighing baskets of clothing in laundromats or crates of consumable goods for resale. Affordable APM bench scales are simple to operate, quality engineered for dependability and usually ship out the same day! There's many different models to choose from for a large variety of applications. Weigh gas cylinders, fire extinguishers or produce with an NTEP scale from UWE. APM Series is available in 4 different weighing capacities with options available for better portability with the Oxy-Weigher or carrying case. 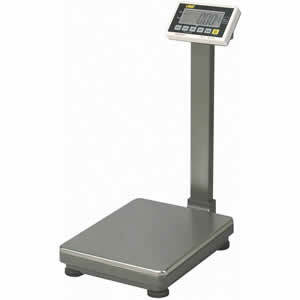 Versatile CCi bench scale operates on AC power or a rechargeable battery for weighing flexibility. Aluminum die cast base construction has a stainless steel cover. Adjustable tower and indicator allow you to move it out of the way to accomodate large parcels or crates that may overhanging. Select from 3 different ranges that best suits your legal for trade application. 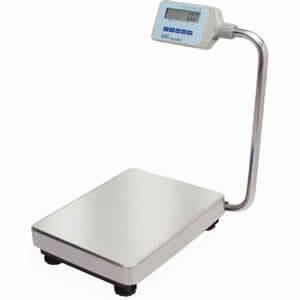 Ishida's IGB-60 digital bench scale features an LCD display and is certified legal for trade. 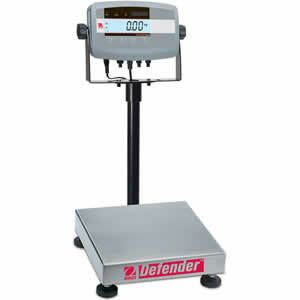 Checkweighing mode enables over/under weighing. 10 PLUs store tare, upper and lower limits. 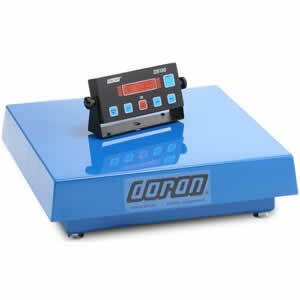 OHAUS DefenderTM 3000 Series economy line of bench scales is ideal for general weighing and simple counting applications in production, packaging, warehouse, inventory, shipping and receiving areas. The Defender 3000 Series feature a simple, yet rugged, tubular-frame base design and indicators with tactile keys, backlit LCD display, built-in rechargeable battery operation and flexible mounting capabilities. The Defender 3000 Series is the solution to your weighing applications that require dependability within an affordable budget. 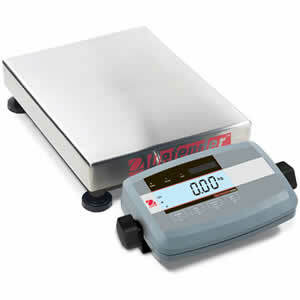 UFM legal for trade bench scales come in 3 different sizes which all feature large 2 inch display with backlight and offer 6,000 divisions. 3 models are available to accomodate weighing capacities from 120 lb to 600 pounds. 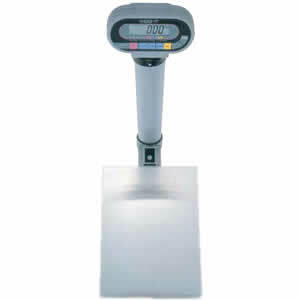 Save on quality quality scales that are certified for commercially weighing products for sale in farm markets, grocery stores or shipping and receiving docks. Mild steel constructed base is coated for protection against wear and tear in a typical dry environment. Choose from 3 different size bases each of which is legal for trade. DS100 indicator is also mild steel and features bright red LED readout. Please call if you do not need NTEP and we can have the scale calibrated at a NON-NTEP resolution at 10,000 divisions. 7000XL stainless steel washdown scales feature IP69K protection against close range high pressure and high temperature spray downs. Its bright red LED display is easy to read and the base has 1000 percent overload protection. Options are available for different types of connectivity including Blue Tooth and Ethernet. Three different size bases are available in capacities ranging from 5 pounds to 200 pounds. Economical design of the legal for trade Ohaus Defender 5000 provides vast number of features needed in an industrial environment. Included T51P ABS plastic indicator is built with large LCD with backlight for easy viewing. It weighs in several units of measure and has functions for counting, percentage, animal weighing, checkweighing and display hold. Painted steel base is concealed by a removable stainless steel cover, while the pillar that connects to the display is also constructed from painted steel. Low Profile Defender 5000 Series is loaded with features and functions, combining an ABS plastic T51P indicator with painted steel bases and columns. 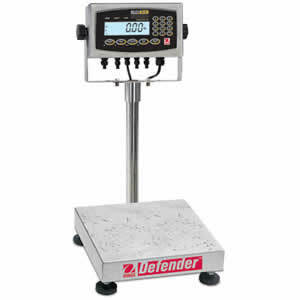 Ideal for shipping and receiving, production, packaging and general commercial and industrial weighing applications, the Defender 5000 offers a multifunctional indicator with multiple weighing units and software modes to meet the requirements of industrial and laboratory applications. Rugged construction, comprehensive yet intuitive software and multiple connectivity options, Ohaus Defender 5000 can meet the needs of demanding industrial operations. 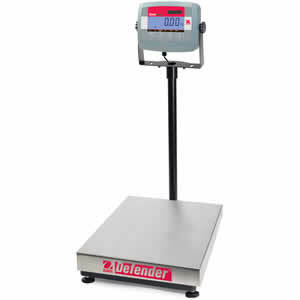 Legal for trade Defender 5000XW Xtreme is a feature-rich line of bench scales, combining stainless steel D51XW indicator with square, all-stainless steel washdown base and stainless steel column. Ideal for production, packaging, general commercial and industrial weighing applications where full washdown protection is required. Ohaus Defender 5000 offers a multi-functional indicator with multiple weighing units and software modes to meet the requirements of industrial and lab applications. With rugged steel construction, comprehensive yet intuitive software and multiple connectivity options, the Defender 5000 can meet the needs of demanding industrial operations. 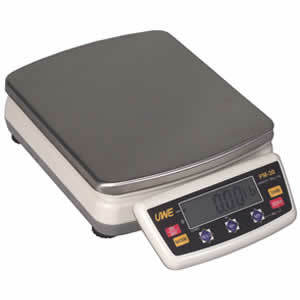 Square washdown bench scales from Ohaus feature NEMA 4X/IP66 stainless steel T71XW indicator and all stainless steel base, dual line display, English or Spanish text, totalization mode, 255 memory library, statistics print output and dual scale counting. This advanced legal for trade scale is loaded with features for applications including counting and check weighing. Combine the many functions with a durable stainless steel construction for long lasting operation. Check weights against preset limits with the CAS Enduro GP. Easily determine if your batch is over or under its limit for faster packing processed in dry or moist environments. 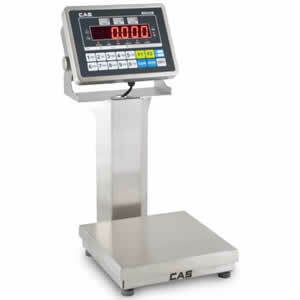 It weighs in pounds, ounces or kilograms and can counts batches of parts. 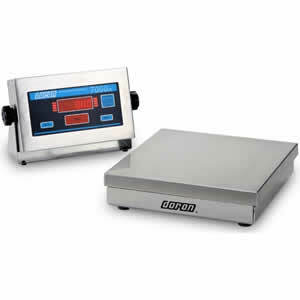 Enduro checkweighers operate on AC power or an internal battery that lasts up to 26 hours of use and charges in 12 hours. Two full duplex RS232 ports allow the scale to connect to CAS printers or a PC for storing and printing data. High pressure washdown protection makes the CW90X truly useful in the fish industry. Stainless steel construction with piezo keypad keep the checkweigher protected against scratches that would endanger the washdown capaability. 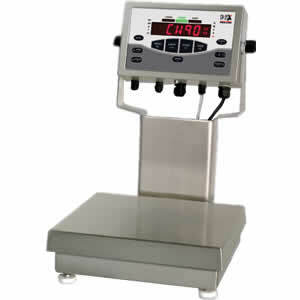 Lights indicate high and low values when check weighing.